New Rhino 3150-4 15' flex-wing cutter, Cat 4 1⅜" 1,000 CV PTO with deck rings, standard pivoting tongue hitch, front and rear single chain guards, set of six 25.6" X 7" X 18" Rhino Trax foam filled tires (eight tires are optional; call for details), 3" cut capacity, 1/2" X 4" blades. Requires minimum of 50 PTO hp, 160 hp gearbox rating, safety tow chain, LED transport light package, New Holland blue color, tongue jack, weighs 5,310 lbs. New Rhino 3150-4 15' flex-wing cutter, Cat 4 1⅜" 1,000 CV PTO with deck rings, standard pivoting tongue hitch, front and rear single chain guards, set of six 25.6" X 7" X 18" Rhino Trax foam filled tires (eight tires are optional; call for details), 3" cut capacity, 1/2" X 4" blades. Requires minimum of 50 PTO hp, 160 hp gearbox rating, safety tow chain, LED transport light package, John Deere green color, tongue jack, weighs 5,310 lbs. New Rhino 2150-3 15' flex-wing cutter with deck rings, Cat 5 CV 1,000 PTO, transport light package, front/rear chain guards, set of six 21" X 7" X 12" foam-filled tires, Rhino orange color, requires minimum 50 hp, standard safety tow chain, weighs approximately 4,300 lbs., 2½" diameter cut capacity. Lists @ $18,525, including freight & setup. New 2019 Rhino TS12 12' flex-wing cutter, 540 slip clutch PTO, 1/2" X 3" blades, Rhino orange color, 1½" maximum cut diameter, cutting height 2" to 12", front & rear chain guards, set of four 20.5 X 7 Rhinotrax tires. Requires one remote valve on tractor. Requires 35 to 60 hp tractor. Complete with freight/setup and pre-delivery. Weighs 2,750 lbs. Two units in stock. New Rhino Turbo 120 dual spindle 10-foot super duty rotary cutter, Cat 4 540 rpm PTO with slip clutch, Cat II & III 3 pt. 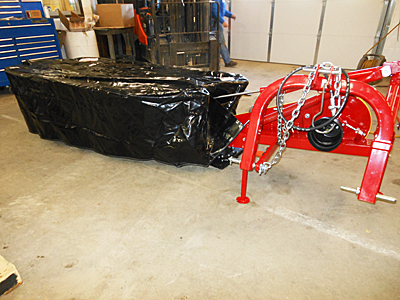 Q-hitch mast, 3" cut capacity, 210 hp gear box rating, requires minimum 80 PTO hp, 1/2" X 4" blades, front and rear single chain guards, two tail wheels with 4" X 15" laminated tires. New Holland blue color. Weighs 2,767 lbs. Lists @ $11,630. New Rhino Turbo 96 Super Duty 8-foot 3 pt. dual spindle cutter, dual caster laminated gauge wheels, Cat 4 540 PTO with slip clutch, front and rear chain guards, 2" cut capacity, New Holland blue color. Lists @ $7,825 with freight & setup. New Rhino SE8A 8' 3 pt. standard duty dual spindle cutter, Cat 4 540 PTO with slip clutch, requires minimum of 45 PTO hp, 100 hp gear-box rating, 1" cut capacity, front and rear rubber deflectors, two tail wheels with 4" X 15" laminated tires, Rhino orange color, weighs 1,161 lbs. Lists @ $5,975. Have a weed problem? We've got the solution: tough, efficient, smooth-cutting Rhino mowers. Check out our large selection and you'll likely find a model to meet your needs. 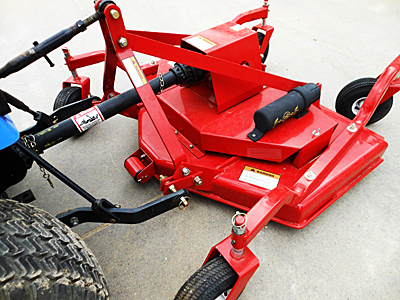 Scroll down the page to check out our inventory of used rotary mowers and stalk choppers. When you find the right model, give Mel, Randy or Charlie a call. The standard color for Rhino mowers is orange. However, they also are available in New Holland blue or John Deere green. New Rhino Twister TW14 48" 3 pt. cutter, 540 PTO with shear pin protection, 1/2" X 3" blades, 60 hp gear box, requires minimum of 20 PTO hp, 1" diameter cut capacity, 3.75" X 15" solid rubber tail wheel, front belt guard with rear steel discharge band, weighs 460 lbs. New for 2017. 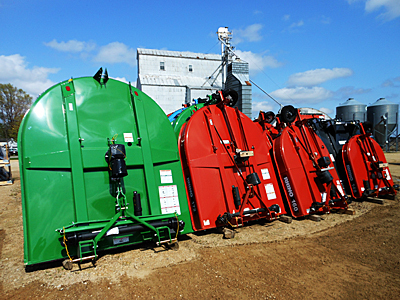 Available in John Deere green, Kubota orange, New Holland blue and Case IH red. New Rhino TW15 60" Cat I 3 pt. cutter, Cat 3 540 PTO drive with slip clutch, 60 hp gear-box rating, requires minimum of 20 PTO hp, 1/2" X 3" blades, 1" cut capacity, weighs 475 lbs. Lists @ $1,790. New Rhino TW16 72" Cat I 3 pt. 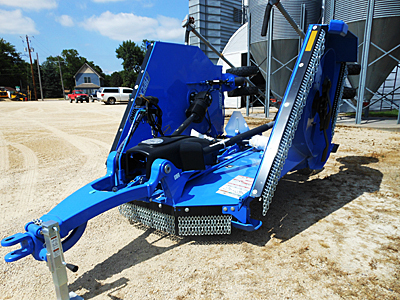 cutter, Cat 3 540 PTO drive, shear bolt protection, 60 hp gear-box rating, requires minimum of 25 PTO hp, 1/2" X 3" blades, 1" cut capacity, weighs 550 lbs., New Holland blue color. Lists @ $1,950. 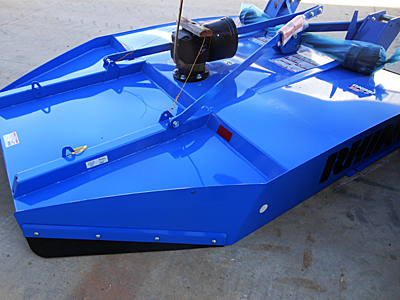 New Rhino TW26 72" medium duty cutter, Cat I/Cat II quick hitch-compatible 3 pt, 65 hp gear box, requires minimum 35 PTO hp, 2" diameter cut capacity, Cat 3 540 PTO with slip clutch, chain guard deflectors, laminated rear wheel, blue color. Weighs 865 lbs. Lists @ $3,030 with freight & setup. We have two units in stock, one blue and one green. New Rhino TW27 84" medium duty cutter, Cat II/Cat III quick hitch-compatible 3 pt., 130 hp gear box, requires minimum 45 PTO hp, 2" diameter cut capacity, Cat 4 540 PTO with slip clutch, rubber deflectors, laminated rear wheel. Blue color. Weighs 1,105 lbs. Lists @ $4,265 with freight & setup. New Rhino TW27 84" medium duty cutter, Cat II/Cat III quick hitch-compatible 3 pt., 130 hp gear box, requires minimum 45 PTO hp, 2" diameter cut capacity, Cat 4 540 PTO with slip clutch, chain guard deflectors, laminated rear wheel. Green color. Weighs 1,180 lbs. Lists @ $4,565 with freight & setup. ● Heavily reinforced 10-gauge deck is domed front to rear and side to side for a sleek, modern look and to help reduce material buildup. 2 1/2" diameter cutting capacity. ● The deck is deeper and blade tip speeds are higher to improve the cut and material distribution. ● Because there is no bracing or gussets under the deck, material flows smoothly, which requires less horsepower. ● Double-lug, quick-hitch compatible three-point hitch is standard. ● 130 horsepower gearbox is covered by a 5-year limited gearbox warranty. Cat 4 slip clutch, 540 rpm PTO driveline. Weighs 1,158 lbs. 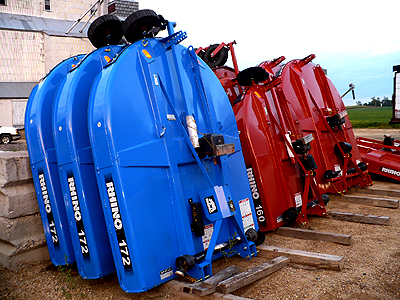 ● Available in Rhino orange, John Deere green, Kubota orange, Case IH red, Massey red and New Holland blue. Lists @ $3,665 with freight & setup. New Rhino 284 84" 3 point rotary cutter, Q-hitch compatible, one rear 15" gauge wheel, 540 PTO with slip clutch, front and rear rubber deflectors, two 1/2" X 4" blades, 130 hp-rated gear box, rquires minimum of 60 PTO hp, 2½" cut capacity, blade tip speed 16,328 feet per minute, weighs 1,265 lbs. New Rhino 284 84" 3 pt. rotary cutter, Cat II & III quick hitch compatible, John Deere green color, Cat 4 540 PTO with slip clutch, two rear 15" laminated tail wheels, 1/2" X 4" blades, 130 hp rated gear box. Requires minimum of 60 PTO hp, 2½" cut capacity, blade tip speed 16,328 feet per minute. Weighs 1,340 lbs. We have two units in stock. New Virnig RBV78-25-0 V50 78" SSL open front deck brush cutter, standard flow 18 to 25 GPM, 6" diameter cutting capacity, three 5/8" X 5" double-sided blades that can be flipped, hoses with flat-face couplers, weighs 1,625 lbs. Also available in 60", 66" and 72". All models available with high-flow options. Lists @ $8,475. 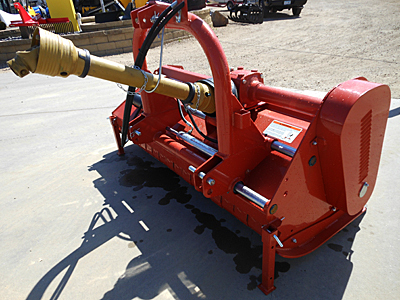 New Virnig RBV72-18 72" SSL rotary brush cutter, for 14-18 GPM SSL, with BCR72 rear roller. Includes hoses and flat-face couplers. Weighs 1,730 lbs. Lists @ $7,110. New Virnig BBV72-25-0 V40 72" open front deck SSL brush cutter, standard 16-25 GPM, 3" diameter cutting capacity, three 1/2" X 4" single updraft blades, hoses with flat-face couplers, weighs 1,310 lbs. Lists @ $5,725. New CID XBC172772 72" X-Treme piston motor brush cutter, hoses with flat-face couplers, 17 to 30 gpm motor, 7" diameter cut capacity, has case drain hose with coupler, three bidirectional blades. Weighs 1,575 lbs. Two units in stock. New CID XBC 72LF 72" X-Treme SSL cutter, hoses with flat-face couplers, requires 14 to 20 gpm flow, 6" diameter cut capacity, three bidirectional blades, 100 hp. right-angle gearbox. Weighs 1,641 lbs. New Y755 84" heavy duty rear disharge 3 pt. finishing mower with hard surfaced blades, Cat I 3 pt. hitch, quick hitch compatable. Lists @ $4,045. Weighs 780 lbs. Available in blue, red and charcoal colors. We have four units in stock. New Y655 72" rear discharge 3 pt. finishing mower with hard surfaced blades, Cat I 3 pt. hitch, quick hitch compatable. Lists at $3,540. Weighs 697 lbs. Two units in stock. Buhler Farm King Y550R 60" 3 pt. finishing mower, rear discharge, 540 PTO drive (PTO shaft included but not shown in photos). Red color. Lists @ $3,204. Weighs 627 lbs. Price includes freight and setup. Buhler Farm King Y450R 48" 3 pt. 540 PTO rear discharge finishing mower. Weighs 442 lbs. Red color. New unit. Lists @ $2,457. New 914A 60" mower deck, fits New Holland TC18, TC21, TC21D compact tractors. Can be made to fit other New Holland compact tractors. Component # 716541016. Shown in the original shipping crate. New New Holland DuraDisc 108M disc mower with MowMax cutter bar, 7'10" cutting width, Cat II 3 pt. hitch, 6 cutting discs with two reversible quick change knives per disc. Minimum 55 PTO horsepower required. 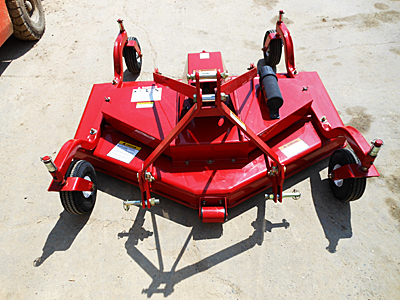 The DuraDisc 108M replaces the H6740 disc mower. We have two units in stock. '12 Rhino RC115 pull type shredder with hard-surface side knives, 670X15 factory wheels & tires, hydraulic lift cylinder with cylinder stops, 1 3/8" 21-spline CV PTO shaft, 207 horsepower-rated gear box, low acreage/shedded, looks and is like new. 2010 Rhino RC20 20-foot pull-type stalk shredder, 1 3/8" 21-spline CV PTO, light kit, hydraulic lift cylinder with hoses, factory wheels and tires, all new side knives just installed. Field ready; sharp, one-owner shredder. 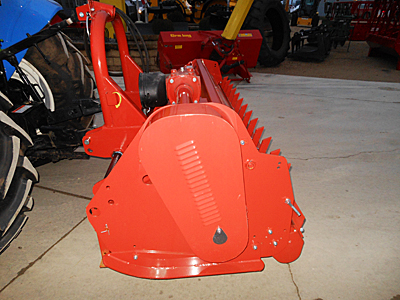 Sold new by Werner Implement Co., Inc.
side knives, 21-spline 1,000 PTO, hydraulic lift cylinder with hose and cylinder stops, red color. Serviced through shop and field ready. Used Buhler Farm King/Allied 16' triplex finishing mower, three 6-foot rear discharge mower decks, 540 PTO, all new blades just installed, clevis pintle hitch bar. Serviced through shop. Used John Deere MX6 3 pt. 6' rotary cutter, 540 PTO with slip clutch, front-rear chain guards, Cat I or II pins. Serviced through shop; low usage.